This is a Muslim organization that promotes a progressive vision for Islam. Muslims for Progressive Values is an NPO founded in 2007 in the U.S. We are a grassroots, faith-based human rights organization that embodies and advocates for the traditional Quranic values of social justice and equality for all, for the 21st Century. Since our inception, we are now in 11 countries and 17 cities with consultative status at the U.N. as an NGO. MPV envisions Islam and an Islamic community that embodies the ten principles of MPV. MPV envisions a future where Islam is understood as a source of dignity, justice, compassion and love for all humanity and the world. MPV establishes and nurtures vibrant progressive Muslim communities. We do this by creating opportunities for religious discourse, volunteer and community activities, and cultural events bringing together the arts, spirituality and social activism. MPV is a progressive Muslim voice on contemporary issues. We voice our perspectives by participating in civil discourse, engaging with the media and government entities, and by partnering with both Muslim and non-Muslim progressive organizations. MPV promotes theologically-sound frameworks for Islamic liberalism. We seek to reinvigorate the Islamic tradition of ijtihad (critical engagement and interpretation of sacred texts) and intellectual discourse. We do this by collaborating with religious scholars and developing position papers on theological issues that are accessible to a wide audience. The story began a few months ago, when the Islamic Renaissance Front, a reformist, progressive Muslim organization in Malaysia, invited me to give a series of lectures on Islam, reason and freedom. The group had hosted me three times before in the past five years for similar events and also published the Malay version of my book “Islam Without Extremes: A Muslim Case for Liberty.” I was glad for the chance to visit Malaysia again. I arrived in Kuala Lumpur on Sept. 22. The next day I gave my first lectureon the suppression of rational theology by dogmatists in early Islam, making the point that this “intellectual suicide” still haunts Muslim civilization. The second talk was on a more controversial topic: apostasy from Islam. I argued that Muslims must uphold freedom of conscience, in line with the Quranic dictum “No compulsion in religion.” I said that apostasy should not be punished by death, as it is in Saudi Arabia, or with “rehabilitation,” as it is in Malaysia. The practice of Islam must be on the basis of freedom, not coercion, and governments shouldn’t police religion or morality. It turns out all you have to do is speak of the police and they will appear. “We heard that you just gave an unauthorized talk on religion,” one of the men said. “And we got complaints about it.” They took me to another room, photographed me and asked questions about my speech. The conversion took place on Honky-Tonk Row, my baptism a glaze of midsummer Tennessee sweat anointing my forehead. Nashville’s Wildhorse Saloon is a tabernacle for line-dancing disciples, and I was in communion with the gyrating congregation. I have a strong respect for choreographed mass dancing; I grew up with the understanding that seminal moments in Bollywood films must be commemorated with synchronized hip shaking. The Wildhorse was a divine revelation — white people, they’re just like us! 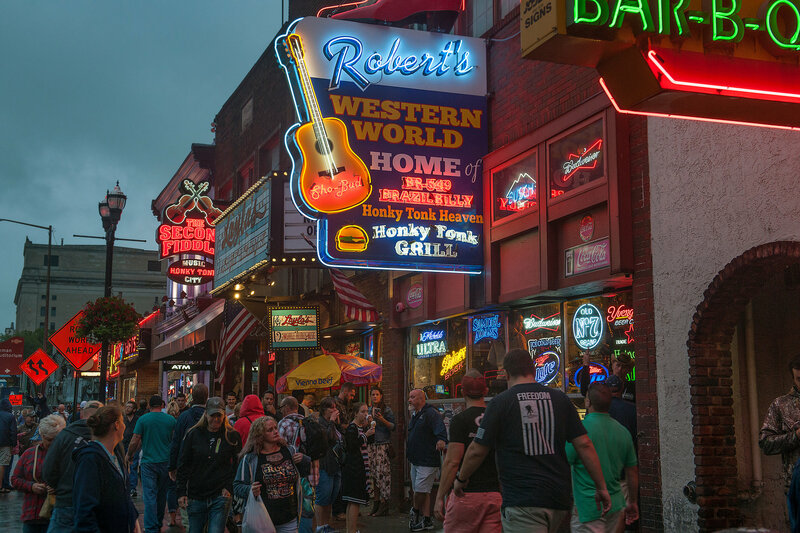 There I was, a Yankee of Indian extraction who had always dismissed country music without a second listen, tearing through Nashville’s Lower Broadway — swaying along to cover bands at Tootsie’s and Robert’s Western World and perusing star-spangled cowboy gear at Boot Country. My visit to the South was long overdue. I’ve lived in five countries on three continents, but the United States has always been the unifying thread; my America is diverse and dynamic and molded by immigrants. But how well did I really know it? Last fall, when I returned from a four-year stint as an expat in South Africa, I deplaned into unfamiliar territory. There was an acrid, unseen fog looming: two weeks later came Election Day. President Trump began his term with a travel ban on certain Muslim-majority countries; this week he’s expanding that diktat, and in what’s become the hallmark of a turbulent presidency, no one has any clue what’s next. As a Muslim American immigrant, am I just a few 140-character proclamations away from having my citizenship revoked? But fear also sparked curiosity. To me, “Wyoming” sounds foreign and peculiar, spilling lazily off the tongue like a yawn and evoking in my mind the wild terrain someone else might associate with a Zimbabwe or Mozambique. What’s exotic to me isn’t food gilded with turmeric and six-day weddings — it’s grits and rodeos. How much time did I have left to experience them? I wondered if, given Mr. Trump’s rhetoric, I would feel like a foreigner in my own home. So I hit the road over the Fourth of July to see how much of an outsider I really was. Ted Hakey Jr. now spends his days working to spread the word of the Muslim community in Meriden. It’s a far cry from what he felt in his heart two years ago when he was arrested after shooting at an empty mosque. “I was a Muslim hater,” Hakey told NBC Connecticut’s Keisha Grant in an exclusive interview. The former U.S. Marine was arrested for a hate crime in November 2015 after firing 30 shots into the Ahmadiyya Baitul Aman Mosque on Main Street with a high-powered rifle a day after the Paris attacks. Hakey said he found himself intoxicated and fed up with attacks halfway around the world. Four of the 30 shots Hakey fired tore through the Baitul Aman Mosque in the middle of the night. It took federal and local authorities just hours to trace the bullets back to Hakey and the FBI arrested him on federal hate crime charges. Zahir Mannan, one of the leaders of the mosque, said those bullets didn’t just pierce walls. They also shot fear through the heart of the Ahmadiyya community. This sect of Islam is made up by the only group of Muslims who believe in the Messiah. The protesters, who gathered after Friday prayers at the Aishbagh Eidgah mosque in Lucknow, the capital of Uttar Pradesh state, used strong language on placards, including “United Nations should boycott the Myanmar government” and “Those putting Hindus and Muslims of Rohingya to torture are terrorists,” according to The Time of India. The ethnic Rohingya Muslims have faced discrimination and statelessness in Buddhist-majority Myanmar for decades, and torture and killings in recent years. About 400,000 Rohingya Muslims have fled to Bangladesh due to Myanmar’s military attacks on them in Rakhine state since since Aug. 25, when the Arakan Rohingya Salvation Army, allegedly a “separatist” group, launched an attack on police posts and a military base in Rakhine state. Those fleeing are having to walk for more than a week to cross the border. Welcome to ”The Story We Share,” a series of Q&As that profile two people with similar identities ― but who live in very different places. As part of HuffPost’s Listen To Americatour, we’re exploring how people’s lived experiences overlap and diverge depending on their zip codes. What is the “American Experience?” It depends where you look. Along with the growing pains that typically mark the transition from girlhood to adulthood, American Muslim teen girls also face the challenge of dealing with discrimination because of their religion. This added layer of vulnerability became apparent during Ramadan this June, when a 17-year-old teen girl named Nabra Hassanen was abducted and killed while walking near her Virginia mosque. The tragedy hit close to home for many young Muslim girls. Like their peers around the country, Hassanen and her friends had left their mosque to eat suhoor, a pre-dawn Ramadan meal, at a fast food restaurant. The joyful nature of that treasured Ramadan ritual was shattered that Sunday morning in Virginia ― and the effects were felt across the country. Hundreds of miles away, in Florissant, Missouri, 17-year-old Salsabel Fares learned about Hassanen’s death through her friends and from her parents ― and not through social media, where she typically gets her news. The murder stunned her. She told HuffPost she nearly broke out in tears when she heard about it. Salsabel Fares is a 17-year-old from Florissant, Missouri. In Brooklyn Park, Minnesota, Arshia Hussain, another 17-year-old Muslim girl, echoed Fares’ words. (RNS) — I spent the 16th anniversary of 9/11 at the 16th annual meeting of the Council of Centers on Jewish-Christian Relations, held under the joint auspices of the Union and Jewish theological seminaries in New York City. Appropriately, the central question before the group was how best to expand long-standing Jewish-Christian interfaith encounters in America to include Muslims. A fellow panelist was Columbia’s distinguished Middle East historian Richard Bulliet, who spoke about his “Islamo-Christian” conception, first published in 2004 as “The Case for Islamo-Christian Civilization.” Bulliet’s idea is that theologically, doctrinally, and historically, Islam and Christianity have far more in common than most adherents of either faith tradition realize.